We turn anonymous site visitors’ IP addresses into physical home and office addresses. Turn your online leads into targeted prospects offline. It’s retargeting with direct mail. We take anonymous site visitors’ IP addresses and run them through our ”reverse append” algorithm to determine physical home or office address. This information combined with website analytics turns your anonymous site visitors into targeted leads. By using one of our variable printing partners you can now send custom direct mail pieces based on product pages visited and geographic location. This allows you to advertise localized product promotions based on your business goals. Most other digital products can only retarget with cookies and online. We take the digital footprint created by visitors to allow our partners to turn it into a physical mail piece, brochure, white paper, or catalog. For B2B businesses, our technology serves as a website lead generation tool. 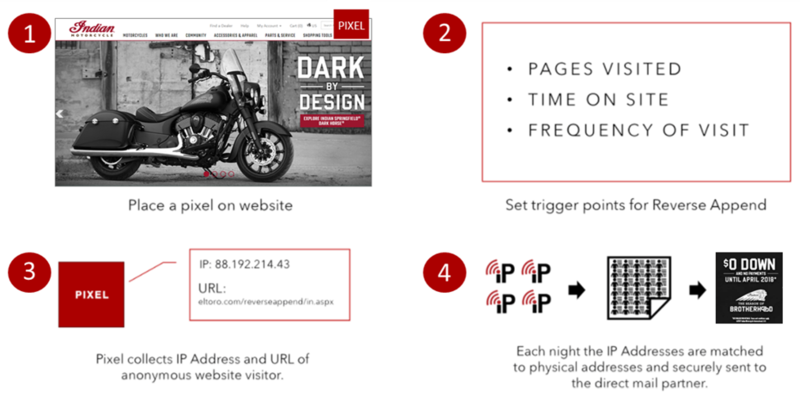 By installing our pixels site-wide, we can use the data generated by web visits to customize a variable print direct mail with attributes of the visit- (e.g. direct mail piece pictures will contain the picture of the specific product page they spent the most amount of time on).